Dimensions 13.0" x 18.0" x 3.0" --- 4.0" x 13.0" x 3.0" 10.0" x 14.0" x 3.0"
13.0" x 18.0" x 3.0"
With a new, modernized design, Eagle Creeks Original Pack-It Cubes help you organize and get use out of every square inch of your travel bag. 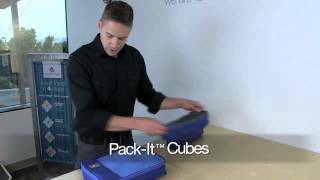 Cubes come in four sizes for quick clothing and accessory packing, quick TSA security checks, or to create a fun, kid-friendly game cube for a long plane or car trip With 101 uses, what are you waiting for? Travel easy knowing everything's right where you want it.